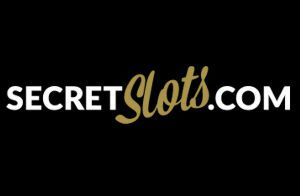 It may still only be early in the New Year, but we’ve already seen some impressive slot games unleashed on the internet. Now, we have yet another one for you in the shape of the Esqueleto Explosivo slot. If you’re good at Spanish, you’ll know that means ‘explosive skeleton’, so does that give us a clue as to what we can expect? The Esqueleto Explosivo slot game is a 5 x 3 online slot game from Thunderkick. You’ve probably heard of the Mexican Day of the Dead festival. Well, this provides the inspiration for this Thunderkick slot game. It’s not the first slot to choose this as its theme, but it stands up well against the competition. We think there’s enough here to delight and entertain players, but will you agree? Skulls are the order of the day, but there’s no need to be alarmed. Those skulls provide the keys to some prizes. We loved the graphics in this game. It’s been created in 3D, and they’ve done away with any notion of spinning the reels. Instead, when you click spin, all the skulls fall away towards you, and are replaced by a fresh set dropping in from above. 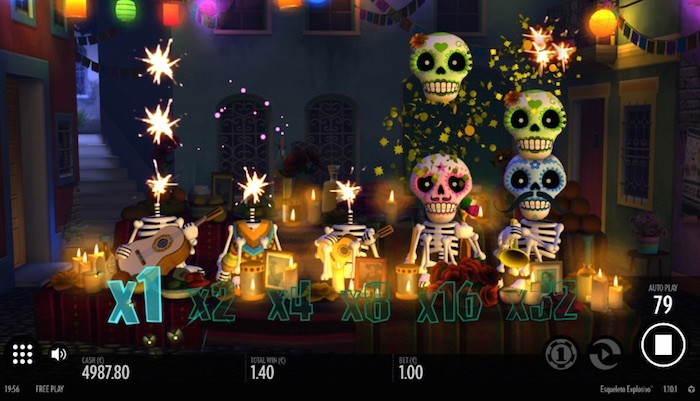 You’ve got a set of floating multipliers in front of those, and if you look closely, you’ll see five skeleton bodies sitting at a table clutching various instruments. These bodies get five new heads every time you spin, so it’s a nice fun touch. If you’ve tried Thunderkick slots before, you’ll be familiar with the nine white dots in a black circle at the bottom left of your screen. This contains the paytable and instructions, which we’ll come to in a moment. Click on the bet value or the coin to change your bet, and the spin buttons are self-explanatory. You can select the page icon from the black circle to read the rules, or the trophy to see the paytable. This reveals just five different-coloured skulls as the main symbols that pay out. The pink one with the rose is the highest-payer, and the greenish one with teeth missing is the lowest payer. The payline arrangements are also indicated at the bottom of the table. You’ll find info on the special features at the top (the paytable scrolls rather than giving you information on different pages). The first feature to mention in the Esqueleto Explosivo slot is the dropping symbols feature. Whenever you secure a winning line, the skulls involved will explode. You know, as they usually do. Ahem. When that happens, new skulls drop in from above to complete the 5 x 3 arrangement. Something else happens, too, and we’ll tell you what that is in a moment. Suffice to say, the Thunderkick Esqueleto Explosivo online slot gives you a chance to win more than once from a single spin. 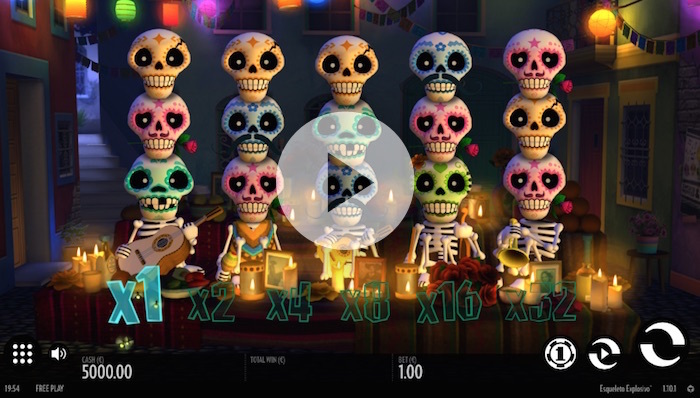 The other feature that occurs when the skulls have exploded is the increasing multiplier feature – known here as Mucho Multiplier. It begins on x1, but then goes through x2, x4, x8, x16 and up to x32, doubling each time. Every time you get a winning combination, the multiplier goes up one place. So, if you get three wins from your initial spin, thanks to the explosive skulls feature, you’ll end up with multiplier wins on the second and subsequent combinations. The Mexican theme continues with an explosivo wild symbol in play too. There’s no scatter in this game, so this one replaces everything else you see. But it has another feature as well. When it appears, it explodes the eight symbols closest to it. This provides additional chances to win, and it also bumps up the multiplier value by one. So, while there are no free spins here, you do get additional free goes if you get winning combinations. With increasing multipliers in play as well, Thunderkick’s Esqueleto Explosivo online slot game is a real (should that be reel?) delight to play. The bets are fixed, so all you need to do is to click on the bet value and choose one of 14 fixed amounts. These range from 10p per spin to £100 per spin. The jackpot amount depends on the bet you place, since all prizes in the paytable are calculated as actual prizes rather than credits. If you place the maximum bet and receive five pink skulls with roses in their mouths, you’ll win £250. With the multiplier feature in play, it could mean winning much more. The return-to-player is listed in the paytable as 96%. We’re spoilt rotten with online UK slots already this year, and the addition of the Esqueleto Explosivo slot makes things even better. The nice 3D graphics make it pleasant to play, and there are enough features here to satisfy a range of players. We found the multiplier feature came into play quite often, and we had a couple of big wins while playing as well. This is a fun slot that dazzles you with stunning graphics and provides an entertaining game too. Will you be brave enough to play on the Day of the Dead and see what Esqueleto Explosivo could bring you?